High reliability and complete working security are the main characteristics of RCF Series Capacitors. Reliability is guaranteed by the use of a high quality dielectric and by rigorous process controls.Security of the product is guaranteed by a series of protection devices:Internal Overpressure Device : This device is activated when the internal pressure increases due to internal short-circuits developing at the end of useful working life disconnecting the internal connections . As the case of the capacitor expands for the operation of the pressure disconnect device, it is necessary to allow at least 10 mm for the case expansion. Do not use rigid connections.Discharge resistors : Internal discharge resistors are used for all capacitors of 55 mm and 65 mm diameter. External resistors are supplied for all capacitors of 75 mm, 85 mm , 100 mm and 116 mm diameter. The function of the discharge resistors is to reduce the voltage between terminals of the capacitor to levels prescribed in the following Specifications EN 60831/1-2 and IEC 831/1-2. SKU: TCC40. Category: Three Phase Capacitors. 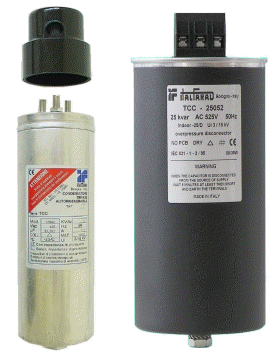 Tags: 3 PHASE, 40 KVAR PFC CAPACITOR 450V 3PH tcc/r, capacitors, TCC40. Inrush Currents : When capacitors are used as part of an automatic assembly, where a large number of switching cycles are possible, the inrush current must be limited to 2 00 In, otherwise the capacitors may experience reduced life expectancy. To ensure that life expectancy of the capacitors is protected, these capacitors should be fitted with suitably rated chokes. Capacitors of 55 mm and 65 mm can be supplied with internal chokes. Capacitors of 75 mm, 85 mm , 100 mm and 116 mm chokes must be fitted external. The above can be supplied as an option extra cost on request. The alternative to chokes it to use special contactors designed for use with capacitors and equipped with insertion resistors. The capacitors are assembled in an Aluminium Case with M12 fixing stud. The 55 mm and 65 mm diameter capacitors are equipped with M6 screw terminals and the 75 mm, 85 mm, 100 mm and 1 16 mm diameter units are equipped with a clamp type terminal . EEC 73/232 Standards (amended by EEC 96/3 – Low Voltage). The dielectric is metallized polypropylene film, filled with non polluting biodegradable material (PCB free).